Investing can be done through variety of investment vehicle such as stock, mutual fund, exchange traded fund (ETF), and closed end fund (CEF). The most popular choice is investing in mutual fund. Mutual fund has 2 main categories: stock fund (equity fund) and bond fund (fixed income fund). I’ll discuss about stock fund especially domestic stock fund. There are three types of domestic stock funds like large cap fund, mid cap fund, and small cap fund. The fund also can be differed according to its investment style such as blend, value, and growth. The mid-cap blend funds invest in various sizes and mixed characteristics stocks. The company stock in this fund usually has a market capitalization between $2 billion and $10 billion. The fund usually tries to be in a middle-of-the-road profile. It is trying to avoid from high-priced growth stocks, but aren’t so price-conscious that they land in value territory. 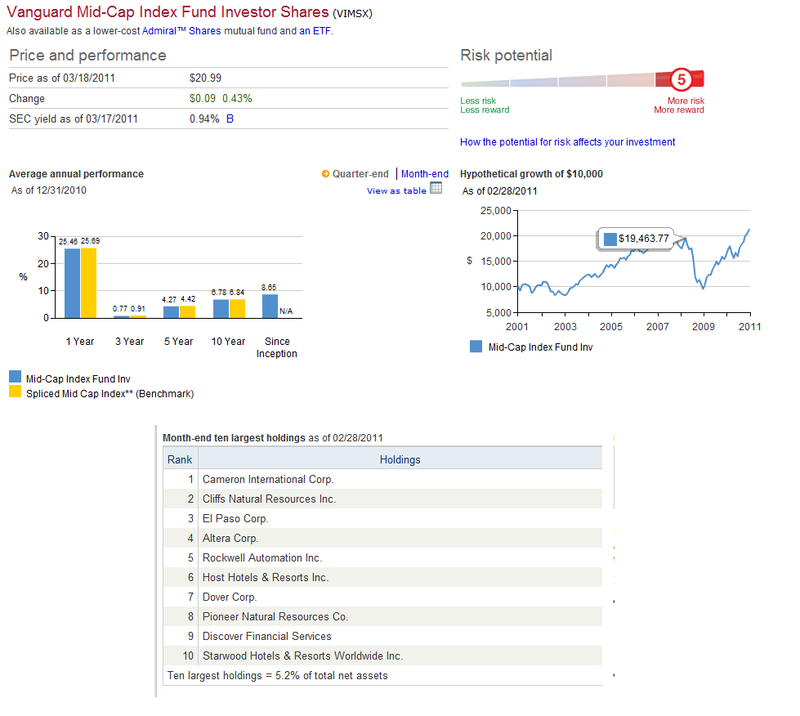 The fund is ranked based on its 2010 performance return. More details can be found on the following table. The investment in Gabelli Value Fund is seeking for long term capital appreciation. 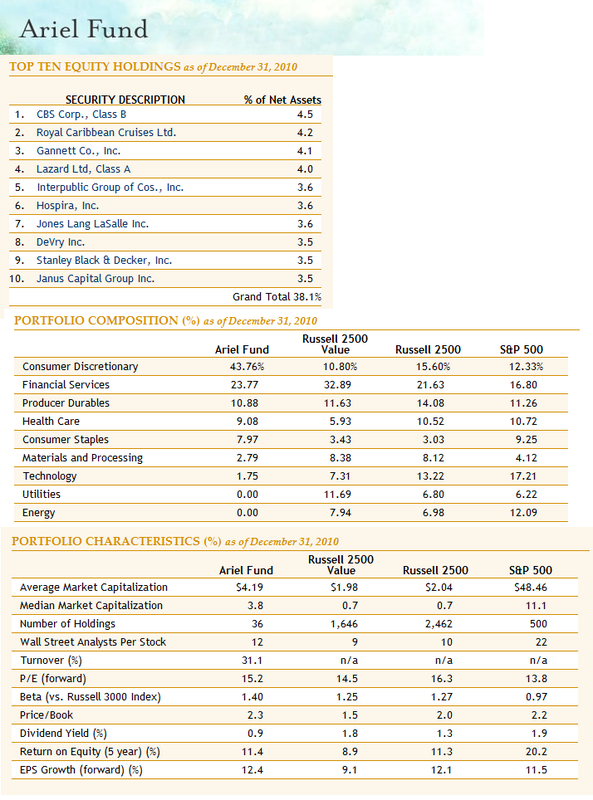 The net assets investment of this Gabelli fund is mainly invested in common stocks. Fifty percent of the total assets are invested in merger or consolidated companies, and twenty five percent in foreign securities. Christopher J. Marangi has managed this fund since 2007. This fund has 1.43% yearly expense ratio, which is higher than the average in the category (1.36%). The minimum balance to invest in this mid cap blend mutual fund is $1,000 for brokerage account and $250 for IRA account. There is no minimum balance for the subsequent investment. GABVX has returned 26.77% over the past one year. This fund has 0.25% 12b1 fee with 5.75% front end sales load. This fund can be purchased from 96 brokerages such as Td Ameritrade, Inc., Scottrade Load, Merrill Lynch, Edward Jones and Fidelity Retail FundsNetwork. The other class tickers of this fund are GVCAX, GVCBX, GVCCX and GVCIX. Some asset classes of fund have lower expense ratio fee, and no front end sales charge fee. 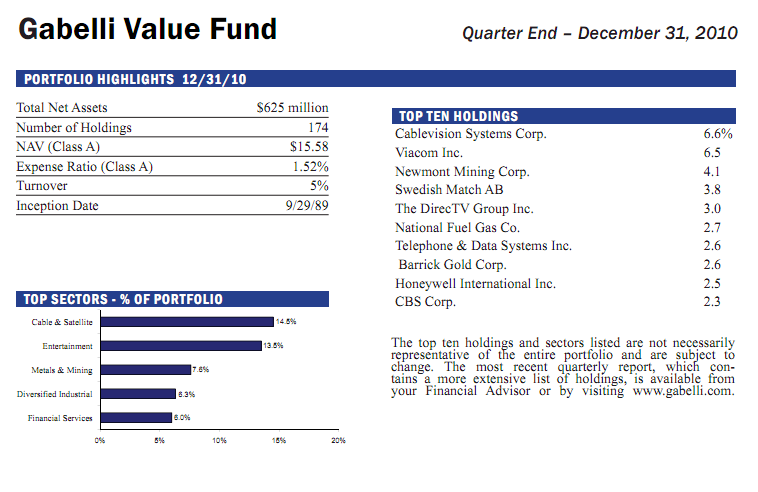 The top 10 holdings of this fund as of December 31, 2010 are Cablevision Systems Corp., Viacom Inc., Newmont Mining Corp., Swedish Match AB, The DirecTV Group Inc., National Fuel Gas Co., Telephone & Data Systems Inc., Barrick Gold Corp., Honeywell International Inc. and CBS Corp.
Ariel’s investment pursues capital appreciation for long-term period. The primary investment of the assets is in common stocks of quality companies, meaning these companies are trusted to be selling at excellent values, exclude tobacco-related companies and hand-guns manufacturer. These companies must also have the market capitalizations between $1 billion and $5 billion at the time of purchase. The fund manager is John W. Rogers, Jr. He is also the Chairman, CEO, CIO and founder of the Ariel investments since 1983. The fund annual expense ratio is 1.06% per year. There is 12b1 fee as much as 0.25%, but no sales load. The minimum balance to invest in the brokerage account of this fund is $1,000 and $250 for IRA account. This fund has returned 8.09% over the past 3 years and 7.62% over the past decade. The top 10 equity holdings of this mid cap blend stock fund as of December 31, 2010 are CBS Corp., Class B (4.5%), Royal Caribbean Cruises Ltd. (4.2%), Gannett Co., Inc. (4.1%), Lazard Ltd, Class A (4.0%), Interpublic Group of Cos., Inc. (3.6%), Hospira, Inc. (3.6%), Jones Lang LaSalle Inc. (3.6%), DeVry Inc. (3.5%), Stanley Black & Decker, Inc. (3.5%) and Janus Capital Group Inc. (3.5%). These top 10 companies make 38.1% out of total holdings. The investment in Northern Multi-Manager Mid Cap seeks to provide long-term capital appreciation. The policy of the net assets investment is major invested in equity securities of medium-capitalization companies as well as initial public offerings. The medium-cap companies are companies whose market capitalization within the range of the market capitalization of companies in the Russell MidCap index. The Northern fund is rated 4 stars by Morningstar. 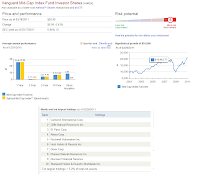 The fund has been managed by Ron A. Muschock since 2008.The expense ratio of this fund is 1.20% per year. There is neither 12b1 fee nor sales load. This domestic stock fund has returned 29.74% over the past one year and 7.42% over the past three years. The minimum balance to invest in this account is $2,500 for brokerage account and $500 for IRA account. This fund can be purchased from 54 brokerages include Pershing FundCenter, Schwab Institutional, Td Ameritrade, Inc., T. Rowe Price and Fidelity Retail FundsNetwork. As per December 31, 2010, the asset allocation for NMMCX is 97% in stocks and 3% in cash. The top 10 holdings of this fund are Expeditors International of Washington Inc. (0.9%), Oil States International Inc. (0.9%), Ameriprise Financial Inc. (0.9%), CH Robinson Worldwide Inc. (0.9%), CMS Energy Corp (0.8%), Newfield Exploration Co (0.8%), Lear Corp (0.8%), Oceaneering International Inc. (0.8%), Fifth Third Bancorp (0.7%) and Hartford Financial Services Group Inc. (0.7%). The investment in Vanguard Mid Capitalization Index Investor is to provide a capital growth. The fund trails the benchmark index performance that calculates the mid-capitalization stocks investment return. The fund tries to reproduce the target index with investing all of its assets in the stocks. This index fund is managed passively by Donald M. Butler. He is as well as the CFA and Principal of Vanguard. He has managed this fund since 1998. The expense ratio of this fund (0.26%) is very low compared to the average in the category (1.36%). This is a no sales load fund. There is also no 12b1 fee. The minimum balance to invest in this fund in either brokerage or IRA account is $3,000. The other class tickers of this fund are VIMAX, VMCIX and VMISX. Some asset classes of fund have different expense ratio fee, higher minimum investment, and as well no front end sales charge fee. The top ten largest holdings of this fund as of Feb 28, 2011 are Cameron International Corp., Cliffs Natural Resources Inc., El Paso Corp., Altera Corp., Rockwell Automation Inc., Host Hotels & Resorts Inc., Dover Corp., Pioneer Natural Resources Co., Discover Financial Services and Starwood Hotels & Resorts Worldwide Inc. These ten largest holdings make the total of 5.2% of total net assets. The investment in Ariel Appreciation pursues for long-term capital appreciation. The major net assets investment is in common stocks of companies with market capitalizations between $2.5 billion and $15 billion at the time of purchase. Normally this fund will not hold more than 50 securities in its portfolio. It will only purchase the stocks of the companies with excellent selling values. Since 2002, John W. Rogers Jr has been the manager of this Ariel Appreciation fund. The expense ratio of this fund is 1.18% per year. There is 0.25% of 12b1 fee. This is a no sales load fee. The minimum balance to invest in brokerage account of this fund is $1,000 and $250 for IRA account. The top 10 equity holdings of this fund as of December 31, 2010 are Gannett Co., Inc. (4.3%), Northern Trust Corp. (4.0%), CBS Corp., Class B (3.9%), Viacom, Inc. (3.8%), Accenture plc, Class A (3.3%), Mohawk Industries, Inc. (3.3%), DeVry Inc. (3.3%), Carnival Corp. (3.3%), Lazard Ltd, Class A (3.2%) and International Game Technology (3.2%). These ten holdings make the total of 35.6% of the total assets. Please check my next article for additional mutual funds.